RANGERS lost their first match since being crowned Championship champions this evening, going down to Hibernian at Easter Road. Coming just 72 hours after Sunday’s epic and unforgettable Scottish Cup semi-final win over Celtic, Mark Warburton’s side were unable to lift themselves to the same levels they found at Hampden, although they would have been extremely disappointed with the manner in which they conceded Hibs’ goals. In spite of playing 120 minutes of that incredibly intense game against their Glasgow rivals on Sunday, however, Rangers showed no signs of tiredness in the opening minutes, knocking the ball around extremely well and putting the Hibernian defence under immediate pressure. But with virtually their first foray into the Light Blues’ half, Hibernian took a lead courtesy of the first display of slack Rangers defending. A loose ball travelling seemingly nowhere wasn’t dealt with by either Rob Kiernan or Danny Wilson on the edge of the area, and that allowed the ever-lively Jason Cummings to nip in and fire beyond a stunned Wes Foderingham. 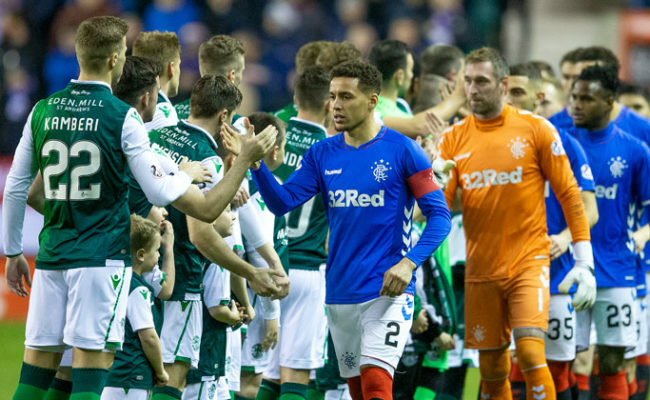 But rather than sitting back and feeling sorry for themselves, Rangers immediately regained the impetus in the game and again had the Hibs backline under pressure. James Tavernier might have done better when he made a rare run to the penalty spot where Jason Holt picked him out with a ball over his shoulder, but the right full-back fired over the bar. 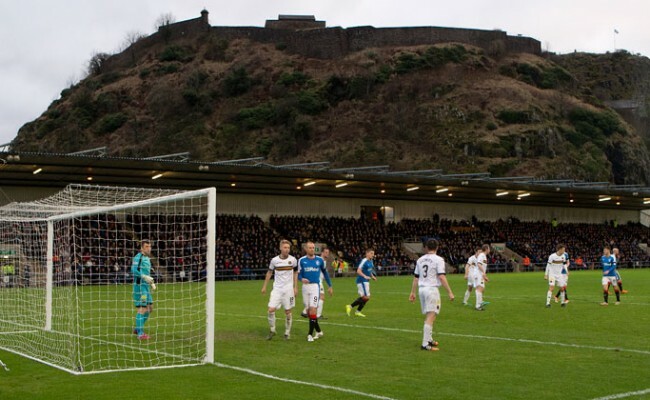 Incredibly however, Hibs managed to gain a 2-0 lead, and once again it came from a Rangers error. Anthony Stokes’ cross from the right wing looked completely harmless as it sailed towards the gloves of Foderingham, but the ball somehow slipped through the grasp of the goalkeeper and found the back of the net. This time, the goal did seem to shock the visiting players, as they took perhaps an extra touch as they tried to steady themselves before fighting their way back into the game. 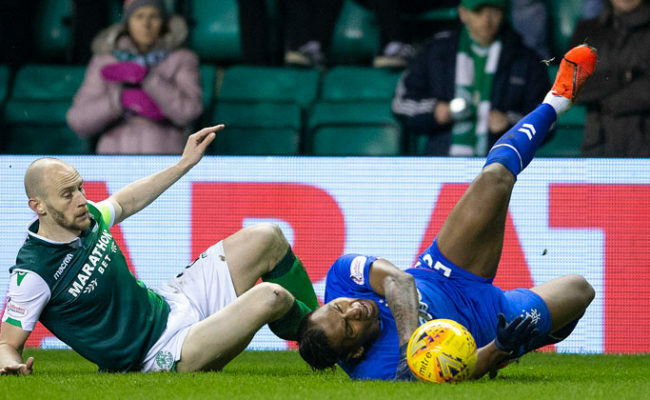 An Andy Halliday volley that slipped well wide when Hibs failed to properly clear a corner seemed to be the best effort they could muster prior to the interval, but from nothing, Rangers pulled a goal back. James Tavernier advanced into the area, but Hibs goalkeeper Mark Oxley looked to be tipping his cross over the bar before amazingly scooping it into the path of the incoming Jason Holt who poked the ball home from all of a yard out. The second half was then to begin in much the same way as the first half did, with Rangers having the vast bulk of the play and the possession, before Hibs nabbed another goal courtesy of slack Rangers defending. Failing to pick up Paul Hanlon at the back post from a corner, he nodded the ball across the face of the goal for Niklas Gunnarson to volley home high into the net at the back post under little pressure. 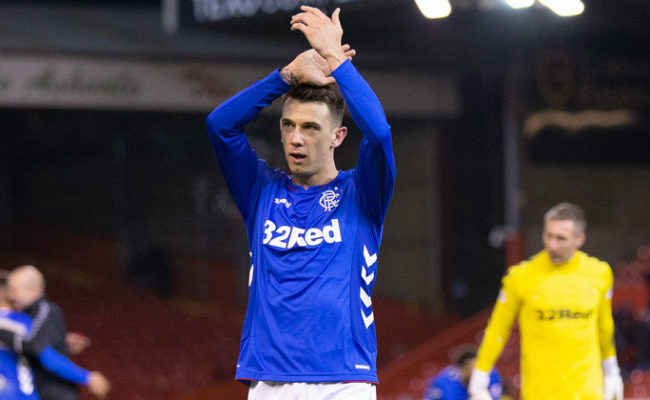 At the other end, the Norwegian then did particularly well to intercept a super Barrie McKay ball across the face of goal that Tavernier looked set to tap home, but by that point, boss Warburton had seen enough, replacing Dominic Ball and Michael O’Halloran with Gedion Zelalem and Billy King. Rangers continued to dominate the ball, but too often their play was predictable, and they were failing on many occasions to penetrate through what was an organised defensive base from the home side. At the other end, Foderingham went some way to atone for his earlier mistake, flying well across his goal to save superbly from a Stokes free-kick. But from nothing, Barrie McKay gave Rangers hope with five minutes left on the clock as he carried on where he left off on Sunday, scoring yet another world-class goal. Receiving the ball from Billy King out on the right, the nippy winger charged forward and let fly from 25-yards, with his effort flying into the top corner. It was the moment of inspiration that the Light Blues had been lacking all evening, and as the minutes ticked down, they at last began to put Hibs under some serious stress, with their best effort coming when a Tavernier ball found its way into the path of Holt on the six-yard line, but his shot on the turn was weak and easily gathered by Oxley. The full-time whistle saw the Rangers support break into a chorus of ‘championi’ with a reminder that the main prize has well and truly been won, but this was still a disappointing defeat for Warburton’s men. 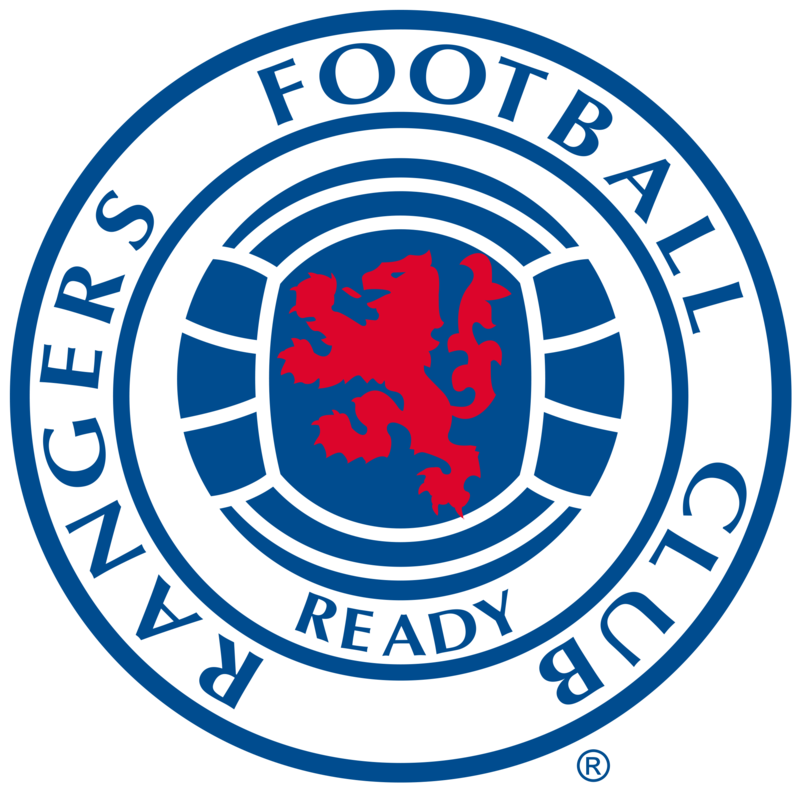 RANGERS: Foderingham; Tavernier, Kiernan, Wilson, Wallace; Ball (Zelalem, 62), Halliday, Holt; O’Halloran (King, 62), Miller (Shiels, 75), McKay. SUBS NOT USED: Robby McCrorie, Law, Clark, Burt. HIBERNIAN: Oxley, Gray, Hanlon, Bartley, Fyvie, Stevenson, McGinn, McGregor, Gunnarsson, Stokes (Dagnall, 90), Cummings (Keatings, 75). SUBS NOT USED: Logan, Henderson, Boyle, Thomson.